Phil Rumsby is CEO of M-Solv. He has worked with lasers and their industrial applications for over 30 years. Initially Phil worked with ultra-high power lasers for fusion reactor refuelling at the UK Atomic Energy Authority at Culham and then for scientific research activities at the Rutherford Appleton Laboratory, where he headed the High Power Laser Group, supervising development and scientific use of the VULCAN high power laser facility. Phil founded Exitech Ltd in 1984 and concentrated on the development of novel industrial laser micromachining applications and the design and manufacture of industrial laser micro-machining tools. After a short period as Business Development Manager for Oerlikon Optics UK he founded M-Solv Ltd in 2007. Phil has published over 50 papers and filed over 40 patent applications dealing with novel optical systems for laser micromachining and with new laser and inkjet manufacturing methods. Janet has over 20 years’ experience in science and technology manufacturing and engineering businesses working at senior management level including executive roles as Chief Financial Officer. Janet started her career with PricewaterhouseCoopers before moving into industry working for Smiths Aerospace, a division of Smiths Group PLC, and later GE Aviation Systems. After a working in a strategic planning and M&A role Janet went on to be CFO of the Smiths Aerospace Customer Services Europe division followed by the GE Aviation Digital Avionics and Electrical Power UK businesses, the groups largest manufacturing and engineering business. After leaving GE Janet went on to be CFO at an advanced materials and energy company, Cella Energy Limited prior to establishing a boutique management and advisory service firm working with science and technology start-ups. She was also Director and CFO of Verditek plc an AIM listed group with interests in commercialising green technology businesses. Janet is an ICAEW Chartered Accountant and has a BSc in Physics from Durham University. David Brunt joined M-Solv Ltd in March 2013 as Production and Quality Manager collaborating with both R&D and the Customer Design Team to complete and deploy a range of niche Capacitive Touch Sensor Technologies for the global market. He brings to M-Solv over 30 years’ experience in the field of Manufacturing, Engineering, Design, Assembly and Quality Management within the Electronics Sector. Prior to joining M-Solv, David was Technical Director of Semitron Industries, a Siemens and later a General Instrument Corp subsidiary, where he successfully developed and produced a complete portfolio of Power Protection Devices (TVS). In 2002, he held position as MD of Cynergy 3 Wafer Fab UK, a subsidiary of Silicon Power Corp (US), engineering and manufacturing Power Switching Devices as a captive supply to Crydom Corp SSR before becoming a Consultant in 2009. He received a BSc in Applied Biology at Bristol University during the 1980’s. Pete Richards joined M-Solv in September 2007 as Engineering Director. He brings to M-Solv 20 years’ experience in the field of mechanical design, manufacturing and assembly of laser micromachining equipment to include stable machine structures, CNC positioning stages, opto-mechanics, precision mechanisms and safety enclosures. Pete works with international manufacturing partners throughout the design, build and installation processes and leads a team of engineers specialising in mechanical, electrical, control system and software design. 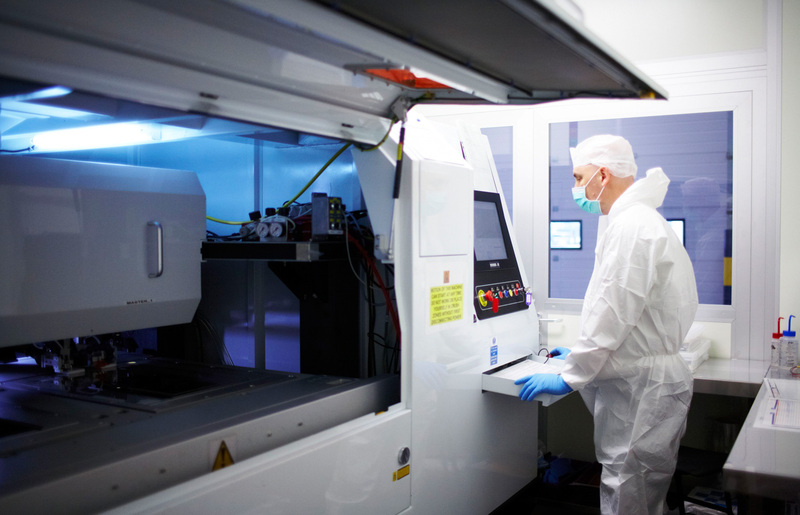 Prior to joining M-Solv Pete was Senior Mechanical Designer at Exitech responsible for the mechanical design of laser micromachining equipment including systems operating within ultrahigh vacuum environments. David Milne joined M-Solv’s senior management team in March, 2008 as Laser Process and R&D Manager. He brings to M-Solv more than 14 years of experience in the field of laser micromachining and machine building. He leads the R&D teams specialising in Touch Panel and Advanced Packaging applications. Prior to joining M-Solv, David was a Senior Technologist at Oerlikon Optics, and prior to that, held a variety of positions at Exitech Ltd, including 5 years at Exitech KK, Japan, as a Senior Systems Engineer, and then as Service & Support Manager. David earned his Bachelor of Science degree in Applied Physics with honours from the University of Portsmouth. Adam has an MA in Physics from Oxford University and a PhD in X-ray optics from Leicester University, where he was a lecturer working on both fundamental research and space projects such as calibration of detectors on NASA’s Chandra X-ray Observatory (counterpart to Hubble Space Telescope). Two soon-to-be launched spacecraft Bepi Colombo (ESA mission to Mercury) and SVOM (Sino-French multi-wavelength astronomy satellite) will carry telescopes with direct heritage to his early-stage work. He left Academia for Industry in 2004 and was part of the team at Exitech that developed the first commercial exposure tools for extreme-ultraviolet (EUV) semiconductor lithography. EUV is now used to pattern the most critical high-resolution features in ICs. He moved to Media Lario Technologies, an Intel-funded Italian EUV and X-ray optics company, where he had a more commercial role, working with customers such as ASML, Intel and Nikon. He joined M-Solv in 2008 as a Senior Technologist, developing laser and inkjet materials processing applications and markets, initially in thin-film PV but quickly expanding his range of activities. In 2016 he became manager of the Process Engineering Department, combined with a shared responsibility for sales. Since mid-2018 he has led a new Business Development (including sales and marketing) group. Supporting all aspects of the business: tool sales, device manufacturing and contract R&D. Mickey Crozier has recently been appointed to M-Solv’s senior management team as Director of Process Technology. Since 2011 Mickey has held a number of positions at M-Solv, most recently Head of Advanced Manufacturing where he was responsible for the successful delivery of many large privately and publicly funded R&D projects principally in the area of energy generation and storage. Initially Mickey joined M-Solv as a doctoral student during which time he developed a patented novel series interconnection method for the manufacture of thin-film photovoltaics (OSI). Mickey has over 10 years experience in laser applications development for a wide variety of industries including automotive, energy and printed electronics. Previously he worked on the application of ultrafast time-resolved laser spectroscopies for the analysis of energy materials, jointly funded by STFC and Johnson Matthey and on development of production processes for the continuous improvement of various DPSS laser designs at Laser Quantum Ltd.
Mickey holds a BSc in Physics from the University of Sheffield, an MSc in Photon Science from the University of Manchester and an EngD from Heriot-Watt University.